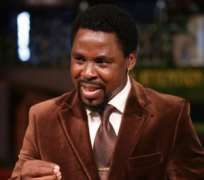 On Friday, the 31st of December, during the New Year Eve, Candle Light, Service Prophet T.B Joshua of The Synagogue, Church Of All Nations declares the year a fresh beginning for its members and Emmanuel TV viewers. This year, 2010 will indeed be a fresh beginning if we can allow God's strength in our weakness. We can't do anything without God; so leave your resolutions for God to handle. The Question now is; what sort of New Year's Resolution should a Christian make? Answer: The practice of making New Year's resolutions goes back over 3000 years to the ancient Babylonians. There is just something about the start of a New Year that gives us the feeling of a fresh start and a new beginning. In reality, there is no difference between December 31st and January 1st. Nothing mystical occurs at midnight on December 31st. A new year is a gift from God, a part of the divine nature of God. In the New Year therefore, you are called to God's kind of lifestyle – His divine essence. Not in terms of unfaithfulness, injustice and corruption but in steadfastness, faithfulness and love. However, if a Christian determines to make a New Year's resolution, what kind of resolution should he or she make? Many Christians make New Year's resolutions to pray more, to read the Bible every day, and to attend church more regularly. These are fantastic goals. However, these New Year's resolutions fail just as often as the non-spiritual resolutions, because there is no power in a New Year's resolution. Resolving to start or stop doing a certain activity has no value unless you have the proper motivation for stopping or starting that activity. For example, why do you want to read the Bible every day? Is it to honor God and grow spiritually, or is it because you have just heard that it is a good thing to do? According to Prophet T.B Joshua, “No matter your level in life, you can still share with others; your love, your strength”. What percentage of your life is producing something of value to God? I think it's high time we learnt how to give our help and support to people around us who need it. Life is better when we give what we cherish to people who are in need.